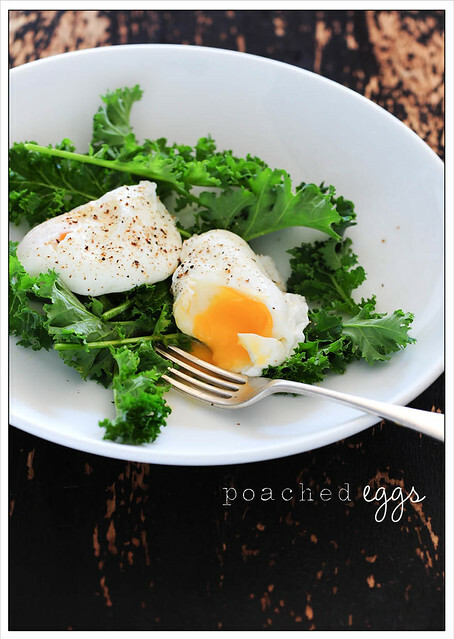 This may sound silly, but I’ve always had a bit of a phobia around poaching eggs. Growing up, we were a boiled or fried egg type of house. I can’t ever remember my mum poaching an egg. So I guess that’s where it all started. Poached eggs were something you ate out. In fancy hotels or cafes. As I started getting into cooking, it wasn’t long before I attempted my first poached egg. With careful water swirling and a few teaspoons of vinegar and the freshest eggs I could get my hands on, I gave it a shot. The results? Disaster. Over the years there have been many more attempts, a few acceptable outcomes and many failures. So when I decided to go Slow Carb at the beginning of the year and started eating eggs for breakfast pretty much every day, it was only a matter of time before I decided to put in some serious effort and master the gentle art of egg poaching. The good news is, I’m now longer a poached egg phobic. Lately they’ve become my daily egg of choice. It’s all about the acid. I find adding a generous slug of white vinegar to the poaching water – we’re talking a good 3-4 tablespoons, is all you need to get good looking poached eggs, every time. Then have a look at the video posted below. I’ve gone ahead and done a little side-by-side comparison for you to show how the vinegar helps the egg keep their shape. When I worked for a big breakfast cereal manufacturer we ate breakfast at work. It used to puzzle me why we would all be hungry and have lunch on the stroke of midday. Now I know. 8. Your hair and nails will grow faster and stronger. This is probably just the protein at work, but I’ve definitely noticed a positive change in how often I find I need to cut my nails. And my hair seems to be growing much faster as well. And if you’re wondering, Ethan is a very entrepreneurial boy who lives near me. We’ve been buying his eggs from our local butcher, the next best thing to having your own chickens. Baby kale leaves, picked from the garden while I wait for my water to boil is my current favourite egg accompaniment but it changes all the time. Baby spinach or other greens would make a good substitute. Or if your kale is a little older and tougher, I find it’s best to finely shred it or cook it quickly in a pan until just wilted. 1. Bring a small saucepan of water to the boil. Add a big splash (3-4 tablespoons) of white vinegar and reduce the heat until it is at a rapid simmer. 2. Break eggs into a small bowl and slide each into the water. 3. Simmer gently for 3 minutes or until cooked to your liking. Meanwhile place kale on a serving plate and make your tea. 4. Remove eggs from the water with a slotted spoon and pat dry with a clean tea towel. 5. 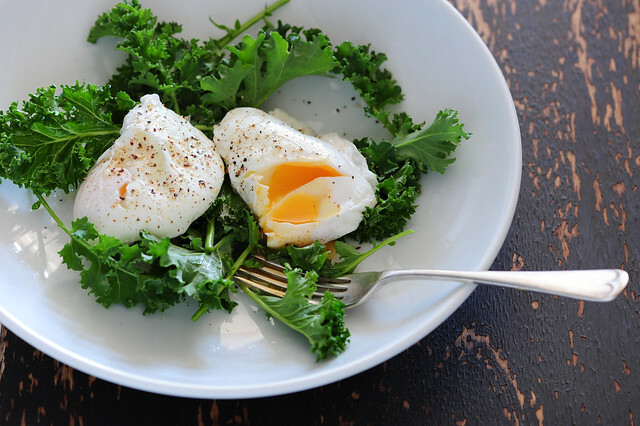 Serve eggs on top of the kale seasoned generously with salt and fresh pepper. Drizzle with truffle oil if you’re in the mood for a little breakfast luxury. And THANKYOU THANKYOU to all the fabulous Stonesoup subscribers who were kind enough to complete my reader survey, or ‘the stonesoup quiz’ as my brother called it. For those of you wondering what Paleo recipes are, all is revealed in my blog post called How to eat like paleolithic man and get more veggies in your diet. I have been having two poached eggs for bfast for a number of years, and I have added vinegar for as long. One thing I have found is to use a slotted spoon and flip just before serving, this keeps the white together and gives a great glazed over effect. I serve on steamed spinach and grated parmasan cheese. Yay – will try tomorrow. Must say egg #2 actually looked half decent compared to some of the explosions I have tried to rescue from my pan. I am determined to be a poaching queen! Local cafe uses white balsamic in their water which works and gives the eggs a really yummy flavour – but only if you are into that kind of flavour – otherwise you’d be horrified! Hi Jules, the other way is to use really, really fresh eggs. Eggs that are only a day or two old poach beautifully, nice and high and rounded with the white all staying together and a yolk that is high and has a glaze of white over it. The white sets while the yolk is still runny. My perfect egg! fun fact: the reason why they make your hair and nails grow faster is the same reason why rotten eggs smell so bad. they’re an excellent source of sulphur. eat up! My mother-in-law has chooks so we get the most amazing eggs (they are HUGE! )… I don’t often eat them for breakfast but boiled for lunch in my salad. Ooooh, so good! Poached eggs with mushrooms, spinach and roasted tomato was my favourite ‘going-out-to-eat-breakfast’ pre-kids. Should just re-create it at home. Yes #2 wasn’t so bad… probably because I was using Ethans eggs so they were still relatively fresh.. I’ve had much worse myself before I got into the vinegar. Thanks so much for this Jules. I love poached eggs cafe style and have been far too intimidated to try at home after some massive flops. Just another Stonesoup recipe I can’t wait to try. I eat 2 poached eggs every morning. I poach them in water alone though – never bother with vinegar! Possibly the secret is the fact that the eggs are super fresh as I have my own hens! I eat them with spinach or rocket from the garden. It is my little daily luxury and is helping me to to shed extra kilos and believe me there are many to shed! I would encourage everyone to try poaching as I think it is easier that anyone thinks and the worst thing that could happen is they would fall apart! I’m a religous eater of eggs – they are soooooo good. I’ve found when I cook with vinegar though it does give a flavour to the egg and makes the white a little rubbery? Am I doing something wrong? After all our testing we find if we bring the water to the boil and then turn it right down when we put the egg in, we achieve perfectly cooked egg in just a little more time. Agree with the other posters – the fresher the eggs are the more they stay together. For all those that eat scrambled eggs – I found out that the less you beat them the more fluffy they turn out (beat slowly until the white and the yolk are only just combined, add a dash of milk and salt & pepper, heat the pan with a small knob of butter – once melted pour the egg mix into the middle of the butter and slowly move your spatula across the pan watching the egg mix bunch as it goes)…..there is a scientific reason the eggs are fluffier this way something to do with the whites and the yolks I’m just not sure what it is. I love paoched eggs – they tend to be a weekend thing though. Not sure why I stick to cereal during the week (it takes just as long as paoching an egg too if you factor in chopping up fruit, dolloping our yoghurt etc). Hmm. I might try to change my routine! I brign my water to the boil, then add the vinegar, slide the eggs in, wait until the water starts to boil again, then turn off the heat completely and pop the lid on the saucepan until the egg is as ‘done’ as I feel I want it that day. To save even more time, poach yourself double the eggs (slip the next one in when the first has taken shape), then lift one out about a minute before it’s done, and put it straight into a bowl of ice water. Store it in the water in the fridge and the next day bring some more water to a simmer and cook the egg for a couple of minutes to finish cooking and reheat. This is what some restaurants do. The egg will keep fine till the next day. yay! I must admit I’m normally a scrambled egg person, but I have tried poached with some success, will give them another go. I love eggs for breakfast, I alternate with a low sugar muesli and natural yoghurt combo, but the eggs certainly have that extra staying power to get me through the longer breaks till lunch! I’ve tried poaching sooo many times and I always use vinegar too. The eggs I get are Clarendon farms which is a local organic free range egg farm just outside Sydney so you would think they would be reasonably fresh. I have the exact same size saucepan as your small one and put the same amount of water in… and my egg always goes everywhere! I always crack into a cup and tip it in very gently too. I don’t know what I’m doing wrong, you make it look so easy!! Hi Jules: I am deeply saddened I won’t get to preview the new e-cook book! I love your site and have reecommended it to my sister who tells me she mainlly frequents ‘food’ blogs, while I usually go for self-improvement, minimalist, feel-good type blogs. Thanks for everything, I LOVE your site. Thank you Jules! I made the eggs for my lunch today (for the first time) :) They were beautifull! I would love a sneak peek at the cookbook!!! Another way – my daughter lines a cup with cling film, breaks the egg into it and then wraps the cling film round the egg and then adds the whole thing to boiling water. I was amazed when she told me and even more so when i saw her do it. I had attempted to poach eggs in plain water with similar results. Thanks for a great demonstration of how to do it and the difference a little vinegar makes. Hi Jules, that egg looks lovely! Great work, we love our poachies here. I’ve tried the cling film thing and it makes me nervous cooking plastic in boiling water… for me vinegar is the best but whatever works for you! Beautiful posts and such an informative, interesting post! I love learning new things and this post is full of that. Fantastic post! Loaded with so much great info…I too am an egg mega fan and will be trying your poaching method. Thanks for sharing! I had a fear of cooking poached eggs but my love for indulgences like Eggs Benedict got me past it. I agree that a dash of white vinegar is the key. A bit late to the party with the commenting here… I’ve been eating eggs for breakfast for a while now (as part of an effort to eat better/low-carb) but seem to have lost my way when it comes to poaching them, so this post last week encouraged me to give it another go. I’ve been doing the vinegar thing and trying to get the water just right before sliding the eggs in gently, but they still go everywhere! It’s not a disaster and they still taste nice, but I wish I could make the whites stay together a bit more. Any other tips aside from the vinegar? What am I doing wrong? You need to make sure you’re using LOTS of vinegar – a good 3-4 tablespoons not just a teaspoon like you see in most recipes. And if that doesn’t work – you need to look at your egg freshness. The fresher your eggs, the firmer the whites and the better they hold together… old eggs = problems. The way I poach eggs is to use a slotted spoon to create a vortex in the simmering water into which eggs are cracked to cook for 3 or 4 minutes, then lifted out with slotted spoon. (This is the method of Chef Gordon Ramsay). I will be controversial here but I still think as one contributer said the vinegar make the whites more rubbery – but as I said before my eggs are at the most 2 days old which must make all the difference. As I am not good at eating breatfast 1st thing so I pack the eggs with a sprinking of S and P and eat them at work. Therefore I recommend to all you keep hens and therefore get the best and freshest poaching potential!!!! Poaching an egg in the microwave, it’s the easiest thing honestly. You have to figure out how your own microwave works and how to get the yolks and whites just like you want them but it is so easy and SO worth a try! I noticed on the “budget week” post that you use Cheats Hollandaise…do you perhaps have a recipe for that? A little late to the party here, but I learned the vinegar trick from my mom years ago — she used it in boiling eggs too in case the shell cracked. Recently discovered gluten-free English muffins and was overjoyed to be able to make Eggs Florentine once again. Poached eggs are grand! I really love this Egg Poacher Set. So easy, no sticking, just some water and some coconut oil to grease the egg poacher cups… And the eggs always come out so nice and pretty! I tried several solutions, including the vinegar, but to me these are by far the tastiest and easiest. (sorry about the link to a store, but I thought it was the best way to explain the concept). I finally tried to poach eggs this way after failing miserably at it the first time years ago – and it worked! I also served it up with some kale that we had, but ordinary olive oil (we didn’t have truffle oil) and I can’t believe how well the ingredients work together. Kale is my new favourite green, bar none. Thanks for inspiring the utterly useless “cook” that I am into becoming less useless! Thanks for these ideas – I am keen to try putting more vinegar into the water. I expect that lemon juice would also work?? where did poached eggs originate? You’re the first person who it hasn’t worked for. I’m wondering if you used enough vinegar? Most recipes just call for a tablespoon and this isn’t enough to make the method work. Glad you had a lovely breakfast Trisha! There are also bags to poach in called Poachies. Thanks for the link Terri! I just stumbled upon this blog looking for egg recipes, and while I am super happy about this poached egg discussion going on here, think I am much more happy to have found this website in general, I see lots of other things I want to read! Love the way you explain things I love poached eggs never knew about vinegar will try it tomorrow mine turn out kinda ugly with just water still taste good but it impresses me to have pretty eggs and great taste does vinegar give them a twang at all? You dont taste the vinegar Sherry… just make sure you pat them dry before serving. I always stir the boiled water and then slip the eggs into the water as it swirls around, this helps keep the whites together and for me always gives a perfect round poached egg! An Irish friend of mine taught me a very easy each poaching recipe. Take large bowl of boiling water, break egg into the water and microwave for one minute on full. Works every time and perfect for when you don’t have time for using a pan. I was wondering how the egg poach tasted after a few days? Egg poaching is my favorite. So I will definitely make it and share my cooking experience with you.